It's Called the Virgin White Box Set. Enough Said. Marvelous Entertainment has announced the official release date for the PSP game Fate/Extra CCC; it's February 21, 2013. Along with a release date, three videos, new character details, and information on limited edition goods of the game have been uploaded to the official site as well. Fate/Extra CCC is a dungeon RPG game on the PSP and is a sequel to Fate/Extra. The game is based off of the visual novel Fate/Stay Night, but in a parallel universe. The first video is a promotional video of the game's theme song "Sakura Meikyuu(Blossom Maze)." The second is a message from the game's main heroine, Saber, to the players waiting for the game's release. The last video is a detailed report on the Figma action figure of Saber that will be attached with the limited edition of the game. The limited edition of the game, or Fate/Extra CCC Virgin White box set, will come with a special figure of Saber in a wedding dress, the game's artwork, stickers with character designs, a character song CD that includes three songs by the voice actor of Saber, and a brides magazine of Saber. 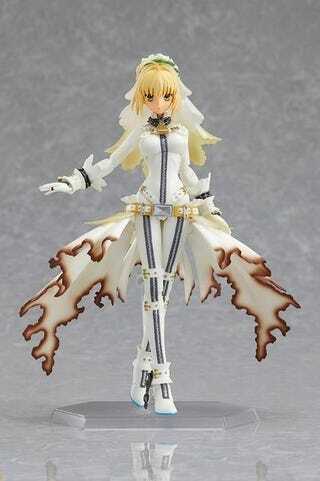 Basically, the Virgin White Box set is completely dedicated to the character Saber. So, here goes the box set? Dun, dun, du, dun.